Today's comics trick comes from Frank King, who in the early 1900s drew Gasoline Alley! 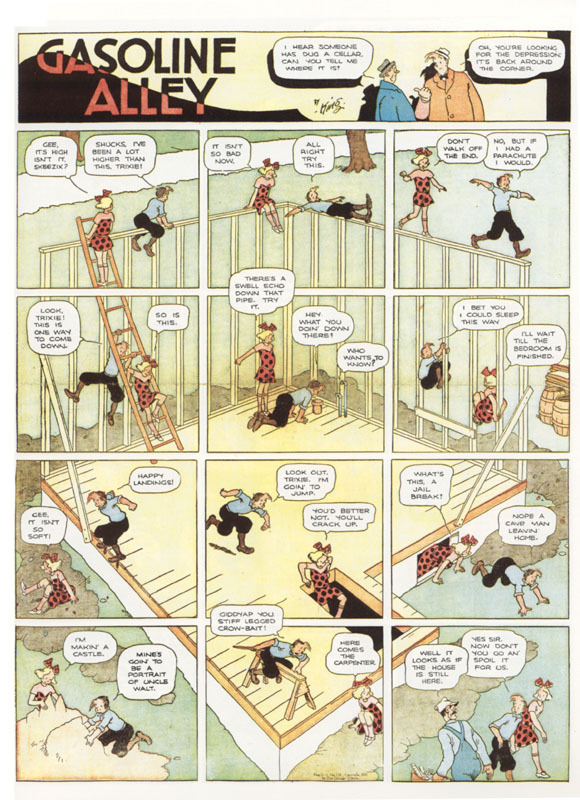 In this particular strip, Frank King took a continuous background and divided it up into 12 equal-sized panels, so the characters can happily move around in them. 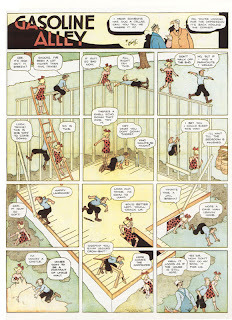 Frank King's Gasoline Alley is absolutely my favorite comic from that golden era. He and Herriman really did wonderful stuff with their Sunday pages. I'm delighted to see you are giving both of them some press on the Comics Cube! The Gasoline Alley dailies also had some very compelling story lines, even if the art couldn't be as adventuresome as the Sundays. Thanks, Professor! I'm honestly trying to decide which collection of Sundays to get - Krazy Kat, Gasoline Alley, or that one by that guy who's going up on the list today. Interestingly, Krazy Kat was syndicated in very few papers, while Gasoline Alley was everywhere. And yet, in interviews, I almost always see Krazy Kat listed down as a major influence, and Gasoline Alley as not so much. My theory behind that is that Frank King's Sundays relied more on color than Herriman's did (not that Herriman's was not greatly benefited by it) - the fall ones and the one with the compass, for example - and since underground cartoonists still mostly work in black and white (with very few exceptions), they can't really apply what they picked up from Gasoline Alley. Hopefully, with new printing technology and more affordable production costs, we get to see more Gasoline Alley-inspired strips in the future. I've seen some modern comics use this technique, Alan Moore does it a lot, but not to this extent. This is quite brilliant! I always love to see old comics art. There's this absurd notion that the Golden Age only produced crap, but artists like Frank King and Winsor McCay were brilliant! I don't think King and McCay count as "Golden Age." The Golden Age is 1938 (Superman) to around 1953 (EC). And the notion that the Golden Age only produced crap is unfair - people were working under horrible conditions for horrible employers. Why take the time to produce a work of art (of which many were indeed capable) if you were going to be badly paid and horribly treated?